Lewis Bush makes some excellent points on the interpretation of photographs. The written or spoken word, body or sign language is a means of communication which most people understand, provided they speak the same language. Yet so many photographers and artists can agree or disagree on what they feel is a good or bad photograph. If two people consider the same photograph as remarkable, you could say they speak the same photographic dialect. If many people praise a photograph, you could consider they speak the same photographic language. What then, when people disagree on the same photograph. Consider the above image, by Kevin Carter during the Sudan famine in 1993. In my opinion it is one of the best documentary photographs ever captured highlighting harsh reality of famine. Carter was heavily criticised for taking this image because he was seen as a secondary predator beside the vulture and not helping the child. Yet starving and dying children were common place then, and not just in Sudan. And not just then either. Carter Killed himself that year due the “memories of killings & corpses & anger & pain … of starving or wounded children, of trigger-happy madmen, often police, of killer executioners”. I wonder how many people would view this image with disdain if they had realised that 20 people an hour were dying at the food station just down the road? The child was not unique. One could argue that viewers are reading different messages or metaphors into images before them. Why is one photograph greater than another, is it because of its content, or it’s visual impact. Is it because one photograph can document an event and another highlight the beauty of a celebrity? And who are the people who agree, disagree, or overlap on their reaction. Is it because they are emotionally touched by the message of the image, or because they can ‘read’ the photograph and indistinctly understand the context. Other people, (with varying degree of overlap) may consider the above image as a simple snapshot of home life. 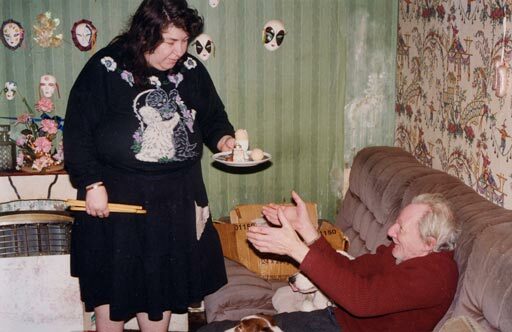 Perhaps it is for some people but for Richard Billingham and his fans, the context of the above photograph (From Ray’s A Laugh) provides an insight into the poverty and deprivation of youth. We each appreciate photographs in a different ways. We obviously enjoy viewing images, we instinctively and immediately appreciate the aesthetic quality of images before us. Yet our views can be quite different to each other, despite a large overlap in photographic genres. This is part of the language of photography, which Lewis Bush speaks of, over at Disphotic there are no solid rules, there are no guidelines and the grey area between communicating a message, and understanding a message is vast.